his foils. Daffy's first appearance was in director Tex Avery's Porky's Duck Hunt (1937). His star potential was recognized right away — only nine months later, Avery's Daffy Duck & Egghead (1938) was released. Like Droopy, Chip'n'Dale and many others, Daffy received his name only in his second outing. To drive home the point, he sang an introductory song in that cartoon — a version of "The Merry-go-round Broke Down" (the Looney Tunes theme) with the first line altered to "My name is Daffy Duck." Daffy never quite made it to the top of the heap at Warner Bros. — popular as he was, Bugs, introduced a year later, always outshone him. As his personality developed, his creative personnel found ways to use his tremendous ego, hair-trigger temper and irrational covetousness to make that second-banana status, itself, a source of gags. Daffy worked well in a variety of roles. In Duck Dodgers in the 24½th Century (1953) and Rocket Squad (1956), he was cast as an incompetent hero with Porky as his more-capable sidekick. In Beanstalk Bunny and Ali Baba Bunny, he was teamed with Bugs to contrast their personality types in a crisis situation. His role in Duck Amuck (1953) defies description. One role in which he did not work well was as an antagonist to Speedy Gonzales — and yet, that's how he ended his career as a star of theatrical cartoon shorts. From 1965 until the studio closed (his last cartoon during that era was See Ya Later Gladiator in 1968), neither he nor Speedy ever appeared without the other. 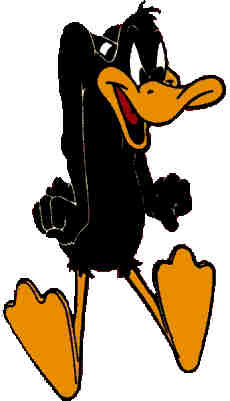 Daffy's popularity continued after his series ended. Not only were his old cartoons endlessly recycled on TV — he also appeared in new animation. He endorsed an occasional product in TV commercials and did bridging sequences in the Bugs Bunny show. During the 1970s and '80s, he was among the Looney Tunes stars to appear in prime-time TV specials, and in 1996, they all co-starred with Michael Jordan in Space Jam. In the early '90s show Tiny Toon Adventures, he stood as the "inspiration" for Plucky Duck. And like many other toons, he had a part to play in Who Framed Roger Rabbit, released by Disney in 1988. In 1999, he appeared on a U.S. postage stamp. Daffy's transition to comic books occurred in 1941, when he appeared in the very first issue of Dell's Looney Tunes and Merrie Melodies Comics. He continued in that venue until the series ended, in 1962, and was one of its mainstays during its 1975-84 revival by Gold Key Comics. He anchored a comic book title of his own from 1953-83. Today, he appears regularly in the third series of Looney Tunes comic books, published by DC Comics. Despite his popularity and versatility, Daffy was never even nominated for an Oscar — a fact which would undoubtedly cause him no end of frustration, if he were a real person. But as a cultural icon, he has long outlasted Max Hare, Gerald McBoing-Boing, Munro, and many others who did win them. Text ©2000-07 Donald D. Markstein. Art © Warner Bros.